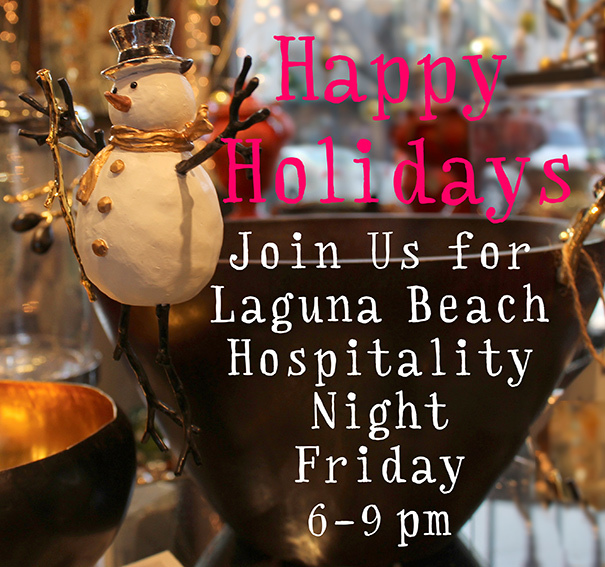 Friday, December 7th is Hospitality Night in Laguna Beach, a community event that kicks off the holiday season. Downtown merchants, non-profit organizations provide a myriad of activities around downtown including carolers and other live music. The event begins with a tree lighting at City Hall. Then Santa makes his way down Forest Avenue to his house on the corner of Glenneyre. Forest Avenue is closed to traffic so it makes for a wonderful evening of walking and mingling in the street. Our shops are directly across from City Hall so you can make us your first stop of the evening. We'll be serving Frank's special gingerbread and hot apple cider. We'll be open late so stop in and say hello. If you've never been to the store before, click here for a map. Don't forget we're offering FREE SHIPPING for the Holidays. This is a great opportunity to let us manage your Holiday gift giving. Stop by the store, call us, or go online with your shopping list and let us handle it from there! There are a few caveats. This offer applies to standard UPS shipping only. Crated and oversized items, shipping outside the 48 contiguous states, and rush shipping are not included in the offer.